Seasonally, it may be Fall but does surf punk have an expiration date? 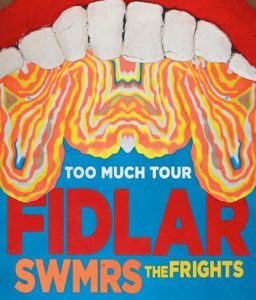 We think not and neither do San Diego surf punk heroes Mikey Carnevale (vox/guitar), Richard Dotson (bass), and Marc Finn (drums) aka The Frights who kick off a series of show dates with FIDLAR and SWMRS this week on the Too Much Tour. It’s what happens when you bug FIDLAR’s Zac Carper to the point that he produces your second full length record, You Are Going To Hate This (out now on Dangerbird Records). Persistence, folks. As tours go, this Too Much Tour has all the makings of a raucously fun affair that lovers of garage rock, surf rock, punk and all junctures where they meet won’t want to miss. So before they hit the road, we asked The Frights some important pre-tour questions….